Paper thin, crackly, crunchy Sourdough Rye Crispbread is a healthy and savory snack – and the perfect accompaniment to soup or stew. So, I’ve been on a bit of a “crispbread” kick for the past couple of weeks. While researching recipes for my recent Oatmeal Crispbread post I ran across so many intriguing recipes that I couldn’t limit myself to just one post. After some experimentation I had two working recipes for crispbread. One version had buttermilk and a little butter in the dough and was more cracker-like in texture-that recipe ended up as the Oatmeal Crispbread. 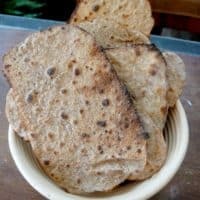 The other recipe was based on a lean bread dough recipe, which I adapted with my sourdough starter and rye flour to create Sourdough Rye Crispbread. Last year I told you about baking in a 180 year-old year wood-fired oven. Our baking days at Gerry’s house are always special, filled with food, fun and conversation. I look forward to it every year. 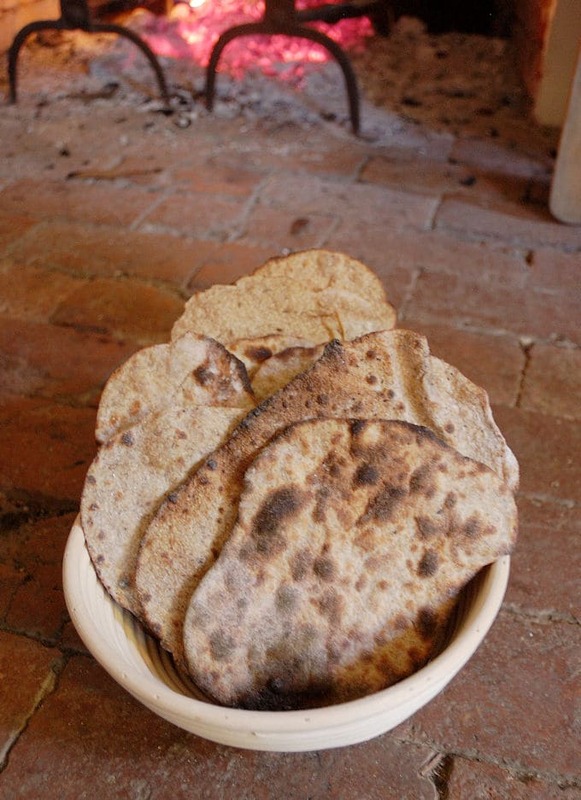 When I was invited to bake at Gerry’s again I knew that I would make this Sourdough Rye Crispbread recipe to bake in the wood fired oven. The super-thin yet stretchy dough is the perfect texture for hearth baking. I packed up my unbaked crispbreads, a still-rising sourdough loaf made from my beer mash starter and an apple galette to bake for dessert. I was ready for a fun day of baking (yes, I’m a total baking geek). When I arrived at the house the oven was already hot and ready to go. Clay, the oven-master for our baking days, had been there since the wee hours of the morning getting the oven ready. Over the years he’s fine-tuned a method for stoking and maintaining the heat in the 7 foot brick-lined oven. The oven thermometer they used to check the temperature actually broke – which means the oven temp was over 600°F. Like I said, the oven was HOT. I thought the Sourdough Rye Crispbread would be the perfect thing to bake first, while the oven was so hot. Since I had 16 of them we figured if we lost 1 or 2 we’d still have plenty to eat. The crisps would be our “canary in the coal mine” to see how the oven was baking. After setting a couple of them on fire, we finally found the sweet spot in the oven for baking the Sourdough Rye Crispbread. It only took about 3-4 minutes for each crispbread to be perfectly baked with lovely charred spots across the bottom. While the oven was still very hot we baked the pizza, then we moved on to the loaves of bread and ended with the apple galette after the heat had tamed a bit. 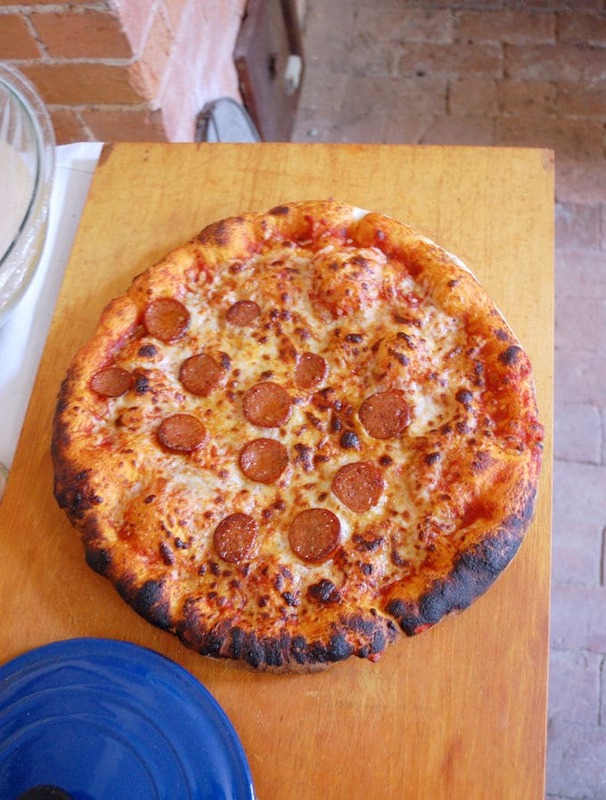 A super hot wood fired oven is the perfect way to bake pizza. It was delicious! I made the loaf at the bottom with my sourdough starter. 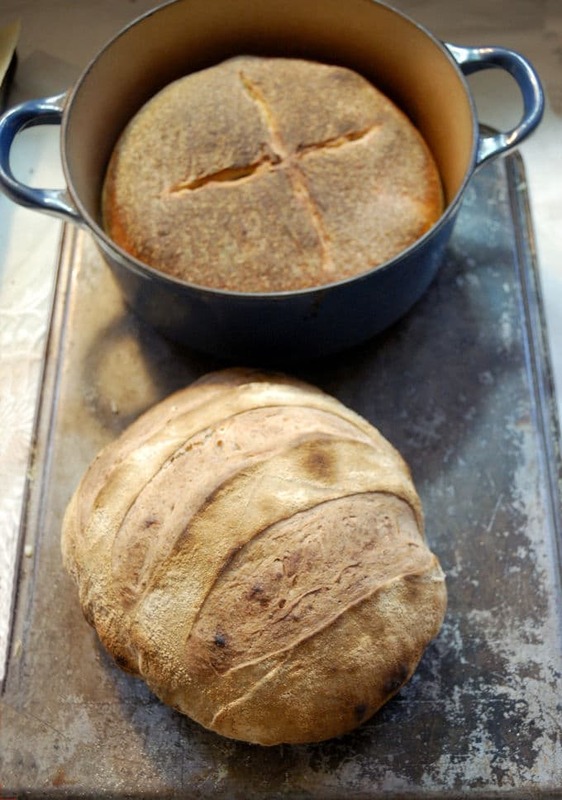 The loaf in the pot was a “grandbaby” loaf made from a bit of the starter I gave to Jody. Now, I know you probably don’t have a wood-burning oven at home (although some folks do have pizza ovens in their back yard, lucky them!). 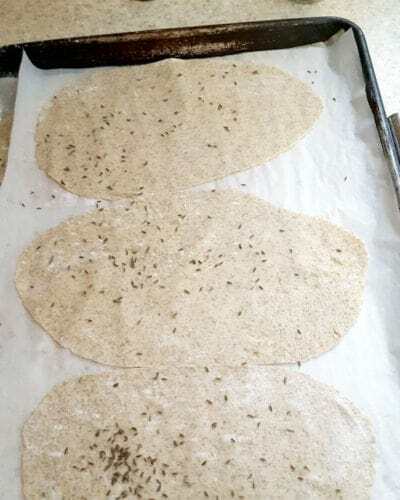 The first time I made Sourdough Rye Crispbread I baked them on sheet pans in my oven. They were still crispy and tasty, even without the bit of char from the wood fire. But I think if I made them at home again I’d preheat my baking stone in a super hot oven (450ºF) and bake them a couple at a time right on the stone. This summer I might even try throwing them on the charcoal grill, like I do for Charcoal Grilled Pizza. Warm bread in front of a fire. What could be cozier on a cold winter day? Thin enough to see through and super crispy. We all loved the Sourdough Rye Crispbread with smear of creamy brie cheese. They were also great with Sara’s delicious soup and later in the day I munched on the leftovers, plain. This recipe is definitely a keeper. 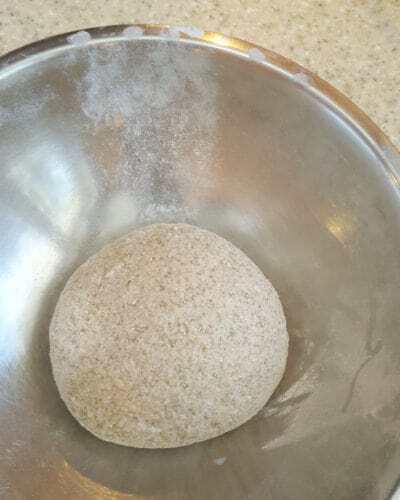 Add the rye flour all at once and mix until the dough gathers on the hook. Let the dough sit out at room temperature overnight or up to 8 hours. If your kitchen is very warm you can refrigerate the dough instead of leaving it at room temperature. Shape each piece into a ball and let rest 4 to 5 minutes on a floured surface. 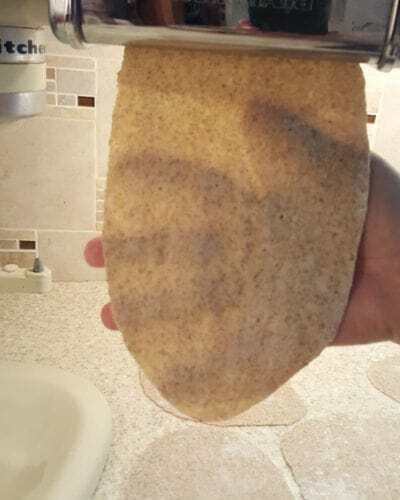 If you have a pasta roller use that to roll the dough (I rolled to #5 thickness). If rolling by hand roll each dough portion to 1/16" thick, the thinner the dough the crisper the bread. 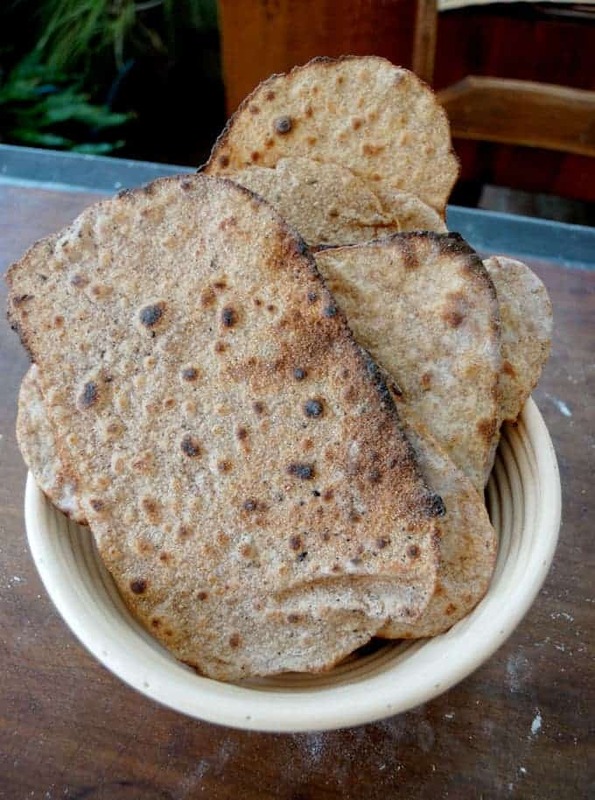 Sprinkle the crackers with caraway seeds and pat them into the surface. Bake about 5 10 minutes until golden brown and crisp. 1. 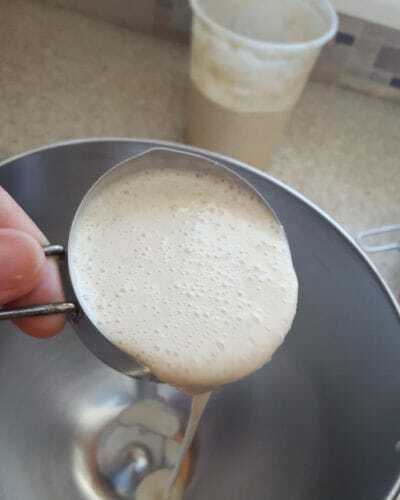 The day before mixing I fed the starter with rye flour. 2. It takes about 4 half sheet pans to hold all the crispbreads. If you don't have 4 pans you can work in batches. Roll all the crispbread and layer them between sheets of parchment to keep them from drying out. As each batch is baked remove the baked crackers to a cooling rack then slide another parchment with dough rounds onto the pan to bake. 3. 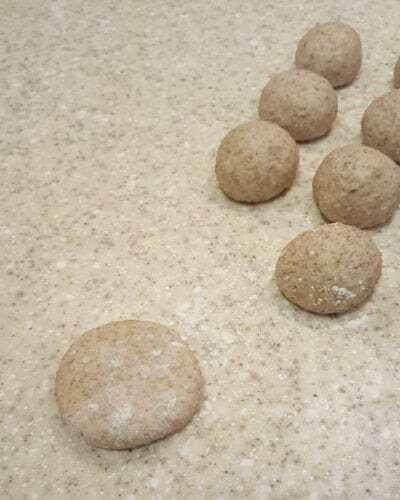 If you have a baking stone you can bake them in batches directly on the preheated stone. Ahh this looks amazing! Can’t beat freshly baked bread! I really enjoyed this recipe! I used sesame seeds and it was delicious. 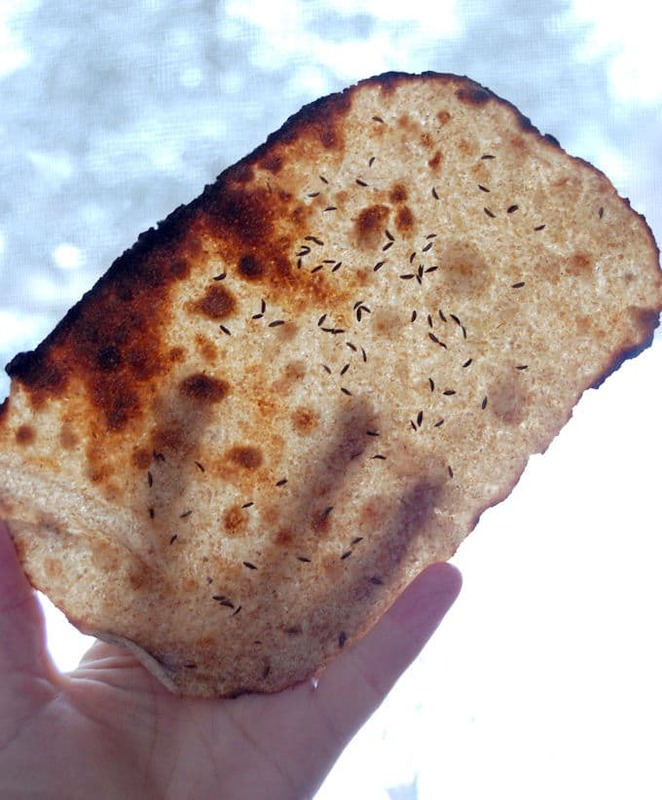 I have been trying to avoid plastic and since crisp bread is wrapped in plastic – here I am . Thank you again for sharing the really good recipe!